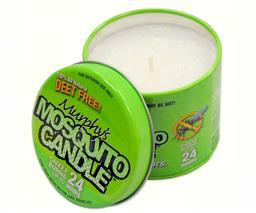 Murphy's Mosquito Candle. All natural insect repellent candle. Palm wax infused with citronella lemongrass and rosemary. Made in Raleigh NC. DEET free and 100 percent plant-based ingredients. Each candle burns from 24 to 30 hours. 5 percent repellent oils most brands have less than 2 percent (OFF! Brand candles have .5 percent). A give back to 'Nothing But Nets' for every candle sold to help fight malaria world wide. Each candle tin has a tin lid to keep the candle dry when not in use.